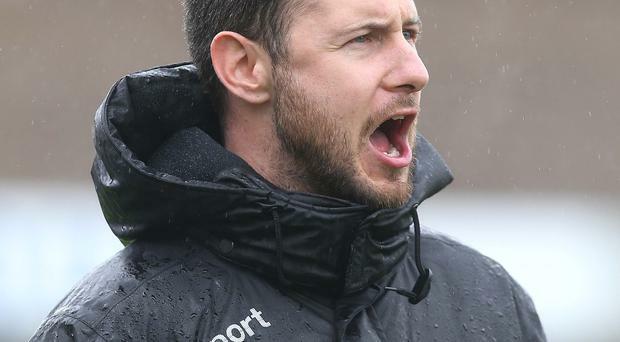 Warrenpoint Town boss Stephen McDonnell says that, though there are derby bragging rights up for grabs this evening, the Mid-Ulster Cup does not rank highly among his priorities. Town travel to face Newry City but, with a Danske Bank Premiership date with Institute looming on the horizon, McDonnell admits he'll have one eye on the weekend when he makes his team selection tonight. "The Premiership is our bread and butter," he said. "Cups come around every year no matter what league you're in and our main focus is staying in this league. "Institute have just come off the back of a good win against Newry, who they beat well, so they're going to give us a seriously tough game on Saturday. "I'm not saying we don't care about the Mid-Ulster Cup or anything like that but I think everyone at the club would agree with what I'm saying." Manager McDonnell has been encouraged by Town's recovery from a miserable start to the league season when, after not picking up a single point from their first six Premiership outings, they have banked 11 from the subsequent 18 up for grabs - and says keeping the faith in their methods was key to the turnaround. "Everyone knows we're going to be down at the bottom end of the table," he added. "It was all about making sure we kept doing what we were doing and believing things would start going our way. "We were losing games but we weren't playing terribly - it was little mistakes that we were being punished for. "Once we cut those mistakes out, I knew we'd start picking up points." By Graham Luney Mick McDermott has dismissed claims he could be prepared to step aside as Glentoran manager while the club make a move for Kris Lindsay.